We will use this address to send you a summary of the steps needed for you to start doing business. What is your current or preferred business structure? For help with choosing a business structure, you can refer to our Business Structure Guide to get descriptions, pros, and cons of each option. Registering your business is a requirement for all businesses in the US as well as those operating on the Navajo Nation. When you register you become recognized as an official business that pays taxes, can apply for a business loan with financial institutions, apply for various certifications, and more. When you register on the Navajo Nation, you become liable for local taxes for all transactions on the Navajo Nation and are able to apply for permits and certifications (if eligible) regardless of whether or not you are based on the Navajo Nation. 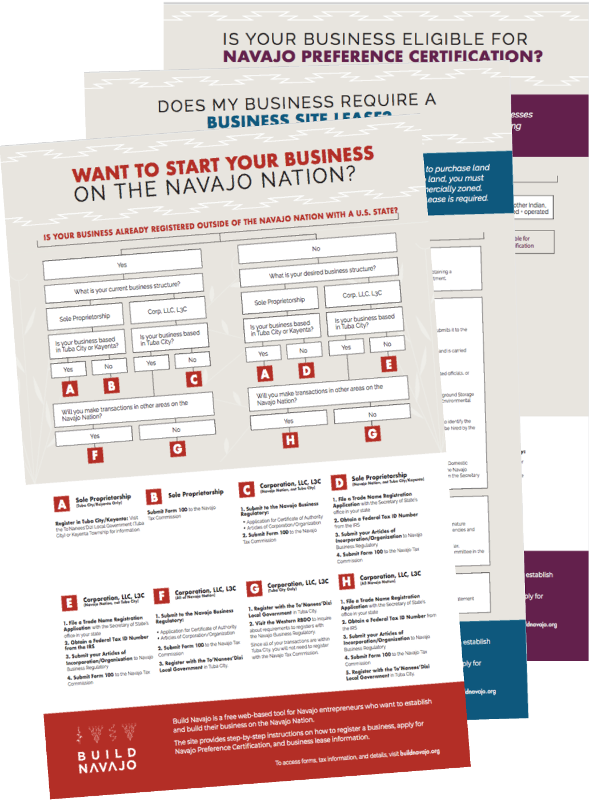 Is your business currently registered with the Navajo Nation? Are you starting a new business or do you have a business that is already registered with a US State? Where on the Navajo Nation will your business be located? Note that if you are running your business from your home on the Navajo Nation, the town/community where your home is based is considered your business location. For example, if you sew custom bags from your home in White Cone, your business location is White Cone, Arizona. Will you make business transactions in other areas/communities around the reservation? For example, if you run a catering business in Kayenta, but travel to other parts of the reservation to cater events, you are making transactions outside of your city. The Navajo Business Opportunity Act gives certified Navajo-owned businesses priority in the bid for government projects. Businesses get certified according to the following classification system: Priority #1 and Priority #2. Navajo Preference Certification was created to benefit Navajo-owned and Native American-owned businesses and therefore only select businesses are eligible. Certification is not a requirement for any business, however if you are eligible and want to apply for contracts with the Navajo Nation government it is highly recommended. You must be registered on the Navajo Nation in order to apply for certification. Answer the questions below to determine your eligibility. Do you intend to pursue contracts with the Navajo Nation government? If you are not pursuing contracts, there is no advantage to applying for Navajo Preference Certification. Is the majority of your business Navajo-owned? If you are Navajo / Dine’ and own 100% of your business, or if Navajo / Dine’ partners own more than 51% of a business, it is eligible for Priority One or Priority Two Navajo Preference Certification. Which best describes the ownership of your business? Is your business applying for Construction Contracting (for general contractors, special trades, and subcontractors) or for Professional Services? Because the Navajo Nation is sovereign, individuals and companies are not allowed to purchase land on the reservation. If you want to build and maintain a physical structure on Navajo land you must apply for a Business Site Lease. If you plan to run a business from your home on the Navajo Nation, depending on the nature of your business (web-based vs. consulting vs. retail) you may be required to apply for a Business Site Lease. Note that you can convert your existing Home Site Lease to a Business Site Lease. Answer the questions below to determine whether or not you need a business site lease and the options available to you. Will you run your business from your home on the Navajo Nation? For example, if you sew custom bags from your home in White Cone, you have a home-based business. Do you need to lease commercial or industrial space on the Navajo Nation? A physical structure could include retail space or plans to construct a building for your business. If you do not need a physical structure on the Navajo Nation, you do not need to pursue a business site lease.